Another three weeks have flown by and baby is still cozy in my belly. Hurray! Unfortunately, while he is snug as a bug, I'm getting more and more uncomfortable. I never realized how difficult it would be to carry this much weight! And he is still going to double in size! Just trying to keep my eye on the prize at this point. Here's a run-down of the past three weeks. 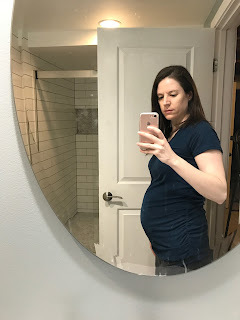 I passed my glucose test! I was worried I wouldn't because before I left the hospital, the doctor told me that the magnesium sulfate could mess with my blood sugar level for up to a week. Glad to have that out of the way. We also had an ultrasound and a BPP. Baby was yawning like crazy! He must have been worn out from all the excitement of the previous week too. And the ultrasound tech said it looks like he has some hair ... that would explain the heartburn! Here's a pic of his sweet profile. Our day-long birth class was on Saturday and it was pretty intense. I left feeling more anxious than before, but knowledge is power, right? Mike learned some massage techniques (which he will hopefully remember!) and there were several videos which he found surprisingly graphic. "What do you think is going to happen, dear?" Ha! And the bathroom is done (except for the window ... don't judge!). We had our Infants 101 class on Thursday. This class wasn't quite as useful to me since I babysat quite a bit growing up, but it was certainly fun to watch Mike change a doll's diaper :) and there were other helpful tidbits here and there, too. We started remodeling the third bedroom (finally!). This will be the guest room once completed so we can turn the current guest room into the nursery. It just needs a bit of framing, drywall, paint and carpet. There's already been good progress on the drywall, so hoping this project wraps up quickly! We also ordered new windows for baby's room and the two bathrooms. We'll be cutting it close with those, but it will be ok even if baby comes before they're installed since he will be in our room for a while. Work was pretty stressful last week with lots of political BS which is my favorite thing ever. I was really glad to make it to the weekend! Thankfully, things seemed to have calmed down now (based on a sample size of one day out of this week ;) ). Hoping for a productive and otherwise uneventful week 31! You are so tall that your baby bump looks so small!! Pregnancy (and motherhood) is not for the feint of heart, as you have now realized. You are doing it and you have got this! By the time Baby Larsen makes his debut you are going to be so cool at everything! The bathroom looks FABULOUS!! Great work, team! Five pounds isn't a lot for two weeks at the end. You're doing great and you look great!